“X” could be anything. It’s always some kind of trigger event that causes guys to screw up and sabotage themselves, and they tend to undo all their hard work and efforts over the past weeks and months. One big screw up could literally undo an entire week’s worth of dieting. Not good. All of these can be prepared for, and thus, the risks mitigated. The problem, from vast experience with this stuff, I can tell you is not “X”. On the surface, it seems like it was all “X”‘s fault. But “X” was really just the event that tipped you over the edge. It was the build-up that was the real cause of this dietary disaster. Imagine an empty sink. Now, put the plug in, and slowly fill it up with cold water. Watch as the water level slowly rises towards the rim of the sink. If you keep filling it up, eventually it will overflow. This is exactly what happens when you’re dieting. Except that instead of water overflowing, it’s replaced by deprivation. This deprivation will build up gradually over time as the diet continues, and then eventually, “X” causes this deprivation accumulation to spill over; and you binge. At least, this is what happens to most people, under most dieting circumstances. Diets such as Keto, calorie deficits that exceed 10%, and any drastic changes to your current eating habits are all responsible for amplifying this overflow of deprivation. Therefore, the best thing to do is to never do these things in the first place. You DO NOT want the overflow. Some build up is inevitable, but the overflow is not inevitable; the overflow is you messing up. And to be more specific, I don’t think you should ever go below about 1g of carbs per pound of bodyweight, for more than a few days, at least. So this means if you’re 200 pounds then you should never allow your carbs to drop below 200g. Instead, look at doing more cardio, doing more general activity or dropping your fats a little. as factors determining how many carbs you should eat per day. This is so mind-bogglingly dumb, it’s quite surreal. Most of them will suggest either zero carbs, or below 50 grams, so that you experience all the wonderful benefits of the magical ketosis fairy (oh, please stop; my sides hurt). What about if you’re really active? Is this still a smart idea? What if you have a lot of muscle to maintain? Is this still a good idea? What about if you’re a heavier guy with far higher maintenance calories? Yet these diets still give the same blanket, all-encompassing recommendations for carb intake. If this isn’t a major red flag to you then you need to improve your critical-thinking skills. Macronutrients should always be adjusted based on activity levels, bodyweight, goals and muscle mass. To ignore this reality, is to be really dumb. Cardio gives you dietary freedom. If you do a lot of it, your daily maintenance calories experience quite an upwards shift, which of course allows you to eat a lot more over the course of any given week – without getting fat. But of course this can be very time-consuming, and boring. Boredom can definitely add to feelings of deprivation. If you have fun whilst burning the same amount of calories, you won’t be simultaneously feeling deprived. These add challenge and team spirit to your cardio and make it WAY more fun, and you’d be amazed by how many calories you can burn in an hour of thai boxing. Just make sure that you don’t use this as an excuse to pig out. The same old rules apply to fat loss: Energy intake – energy output = small negative number. So you must still figure out your daily maintenance calories (with the added cardio), then eat accordingly – 90% of your daily maintenance. 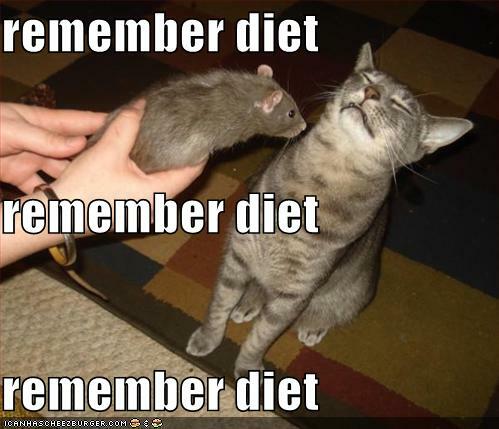 Although taking two weeks off from your diet may seem counter-intuitive and you’re not making any progress (OMGOMGOMG! ), it can be a really good long-term approach if your sink is starting to get too full. It’s a controlled release of water, rather than an out-of-control flood. The last thing you want, and I mean you EVER want, is an uncontrollable flood. It starts a vicious cycle that’s difficult to untangle yourself from. Now, during these two weeks you are not really “off”, you are still “on”, so you’re certainly not in vacation mode. The key mindset to have is that you are shooting to maintain your current progress. This means you need to eat at maintenance calories, rather than 10% below them. These two weeks are perfect for allowing a little more “life balance”, recovery, relaxation, and bascially allowing the water to dissipate. Then once these two weeks are over, instead of being in a stressed out, erratic and emotional state, you will be very hungry for more fat loss in a very controlled manner.